Welcome to my new vegan mortadella luncheon recipe inspired to Italian culinary tradition, but without the cruelty: a delicious vegan version of the typical mortadella. A fragrant luncheon commonly eaten sliced with freshly baked bread or for a quick meal. 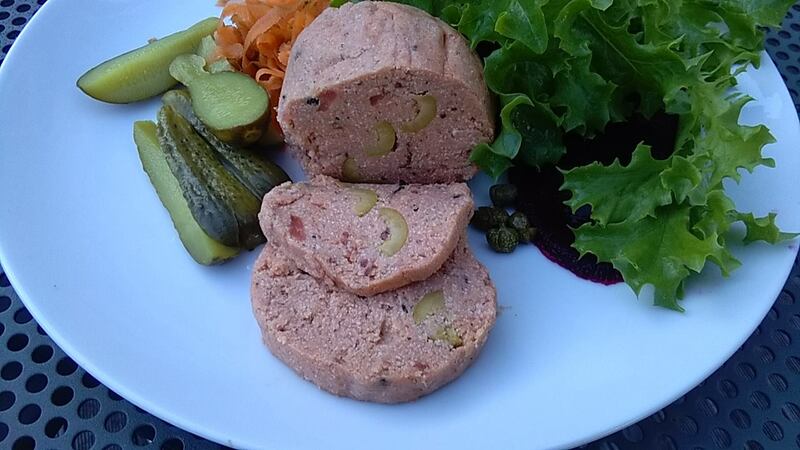 Another name for this vegan mortadella luncheon is also ‘Bologna’. Typically contains black pepper grains, and sometimes pistachio nuts. In this case I used green olives instead of pistachios as they are also used in some versions. The recipe is very easy and requires simple ingredients. I left the vegan mortadella luncheon in my freezer overnight after wrapping it into baking sheet and giving it a vegan sausage shape pinched with two clips on both sides. This helped to achieve a firmer constencyafter defrosting it, although you might want to use a little more tapioca flour if you like it firmer. This vegan mortadella luncheon lasts in the fridge even up to a week, and I have even tried to warm a slice in a pan to make a sort of patty and it was very tasty as well. The idea is to have it sliced in a sandwich for a quick work lunch or whenever you have no time. As a bonus , this vegan mortadella luncheon is also packed with proteins and very healthy. I had a look at the spices used in the non vegan version of this product in Italy, and was horrified at the way this is done. I hope my recipe can make more meat eaters aware of the cruelty they are causing and the nasty stuff they put in their bodies (not just talking about animal fat but also nitrates and preservatives and salt). I do hope that recipes such as this vegan mortadella luncheon or the rice paper bacon will also help transitioning vegans not to miss meat based products, with equally tasty vegan alternatives you can make at home without breaking the bank. liquid from a tin of betroots for the colour .Tip: I always freeze both aquafaba and beetroot liquid in small containers for a later use. Once cooled, with the help of a baking sheet, shape into a form of sausage and put two clips or elastics on both sides and freeze for at least 4 hours. Defrost, and it’s all done. I can’t wait to make this – however the recipe doesn’t list the spicing quantities used!! Hello Lizzy,thank you! you will have to taste it as you go as it depends on your preference. For example I added lots of garlic as I love it! But you might find it overpowering, bear in mind it’s made up so it’s a kind of experiment. I think I need to work on improving the texture to more compact, maybe adding some rolled oats? spices are to taste, good luck!